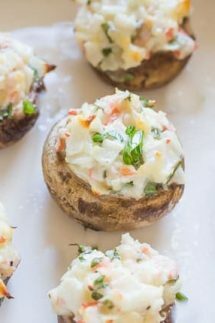 Crab stuffed mushrooms – you can’t go wrong with these little beauties, they have a wonderfully cheesy filling that’s chock full of flavor and includes garlic, cream cheese, chives, crab, parsley and yet more cheese in the form of cheddar and parmesan! It’s really easy to make the stuffed mushroon filling and then all you need to do to attain crab stuffed mushroom perfection is to bake them in a hot oven and before you know it, they are done! 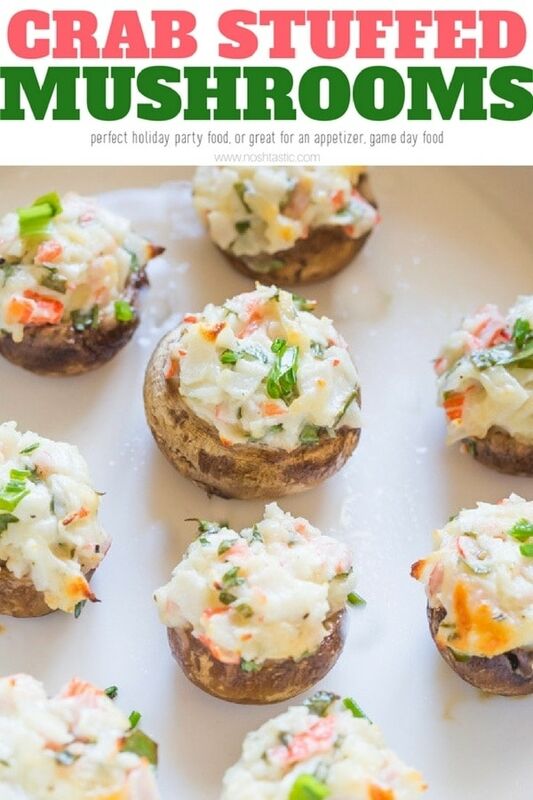 You can even make the crab filling and prepare the mushrooms ahead of time so if you are having a party you can stuff the mushrooms and bake them as you need them. You need to clean your mushrooms first. I find that the easiest way to clean mushrooms is with a very slightly damp paper towel and brush off the dirt, but bon’t make the cloth too wet or your mushrooms may get soggy. 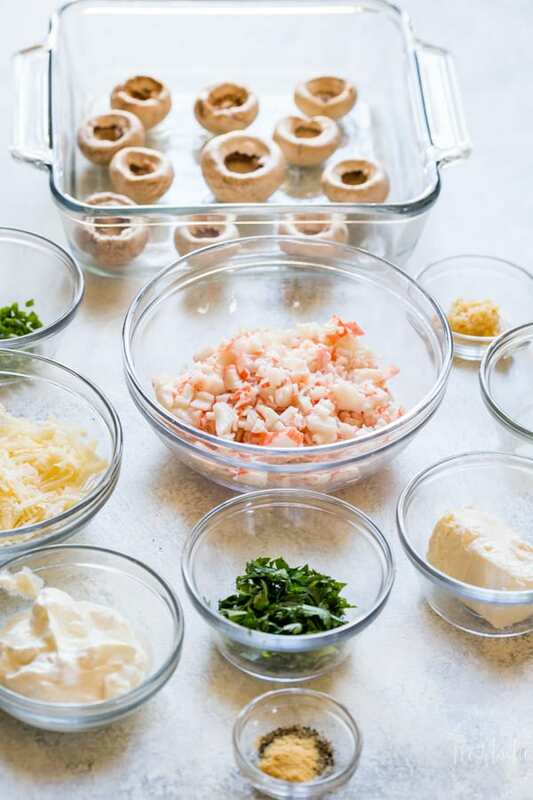 Make ahead tips – I suggest that you make the crab and cheese stuffing ahead of time and keep in the fridge and then prepare the mushrooms by cleaning them as suggested above and removing the stems. You can do this a day ahead. On the day you want to serve them you can stuff the mushrooms a couple hours ahead of time and keep them refrigerated on the sheet pan ready to go into the oven when your guests arrive, they don’t take long to cook and you want to serve them hot. I made my crab stuffed mushrooms with gluten free crab sticks simply because it’s much cheaper to serve to a crowd, you can of course used real canned or fresh crab instead. Sheet Pan – I used a large sheet pan to bake them on, you can get a lot on there, probably even a double batch! 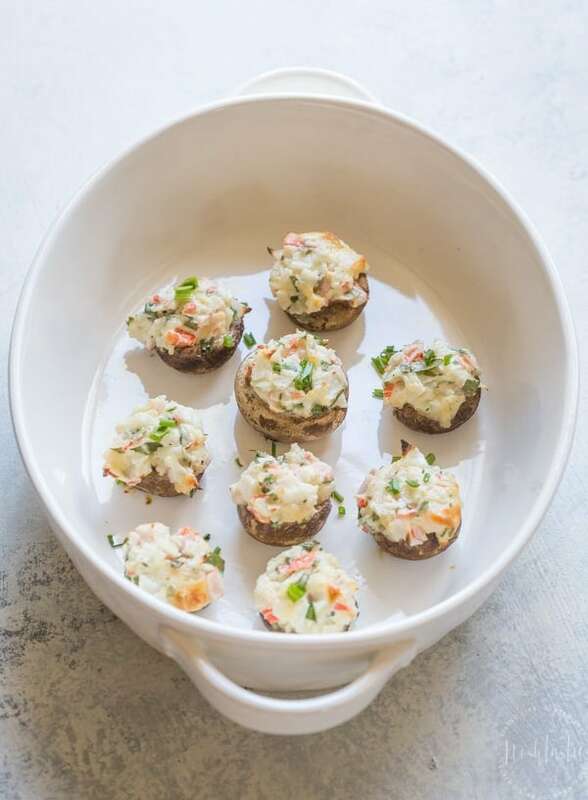 Crab Stuffed mushrooms are the perfect little appetizer, made with garlic, cream cheese, chives, crab, parsley, parmesan, and cheddar. Mix all the cheeses, crab meat, sour cream, mustard, parsley, chives, garlic, and lemon juice with a little salt and pepper to taste. Clean the mushrooms with a slightly damp paper towel and remove the stems. Fill the mushroom caps with the crab stuffing and place on a parchment lined baking sheet for easy clean up. Bake for 20 minutes or until topping is a little bit golden brown and the cheese has melted. You can easily make these ahead of time, the filling will keep a couple days in the fridge. Then all you need to do is remove the mushrooms stems from the caps and add the crab stuffing on the day you want to serve them. This is approximate per mushroom. It's calculated assuming 24 mushrooms and all the filling has been used (in 24 equal measures!) If you have some leftover filling then the per mushrooms calories will obviously be less.